Self-use software – Managed by the user. Formulating Real Estate Strategy and valuation services. Comprehensive real estate asset and portfolio management platform equipped to handle all kinds of Immovable properties. Managing transactions at all stages of property lifecycle viz, Purchase, Rent or Sale. All your planned and unplanned tasks now tracked real time with our Task Manager. Forecast of monthly, quarterly and annual inflow and outflows from the properties. Safe and secure storage of documents on cloud in digital form. Efficient asset allocation and in-depth market knowledge from in-house experts. Assisting in valuation and diligence exercise for all kind of properties. Systematic input combined with detailed reports enabling efficient time management. 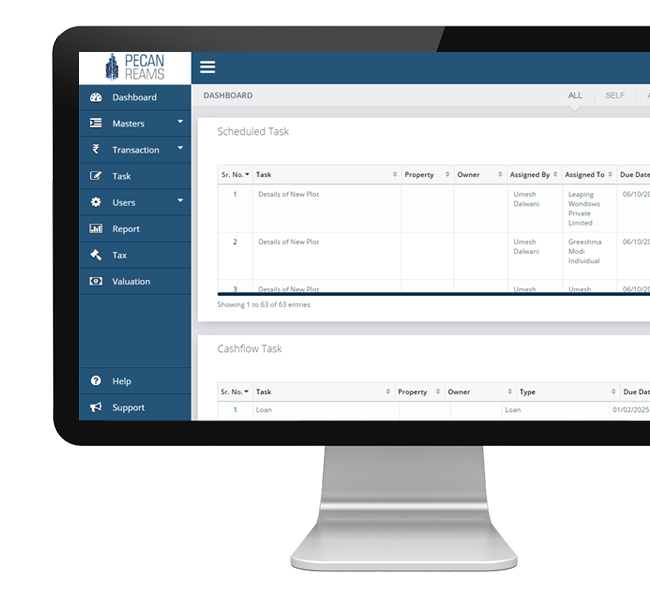 Auto reminders for periodic and cash flow tasks added state of the art task management. Data Encryption and highest regard to Client Confidentiality is our commitment. Array of reports from Group level to Owner level to Individual assets enabling detailed analysis. Maker Checker process at all levels and auto generation of reports leads to reduction in errors. In-house industry experts giving sound and quality advice.